Lissy Lovett and Blake Backlash have some theatre recommendations for you from this year’s Edinburgh Fringe. This show had a lot of buzz leading up to the festival and sold out almost immediately. Bryony Kimmings is an established performance artist and has made shows previously about both her drinking and having an STI, and in 2013 with her niece Taylor created Credible Likeable Superstar Role Model, a show about about the sexualisation of young people which I really loved. 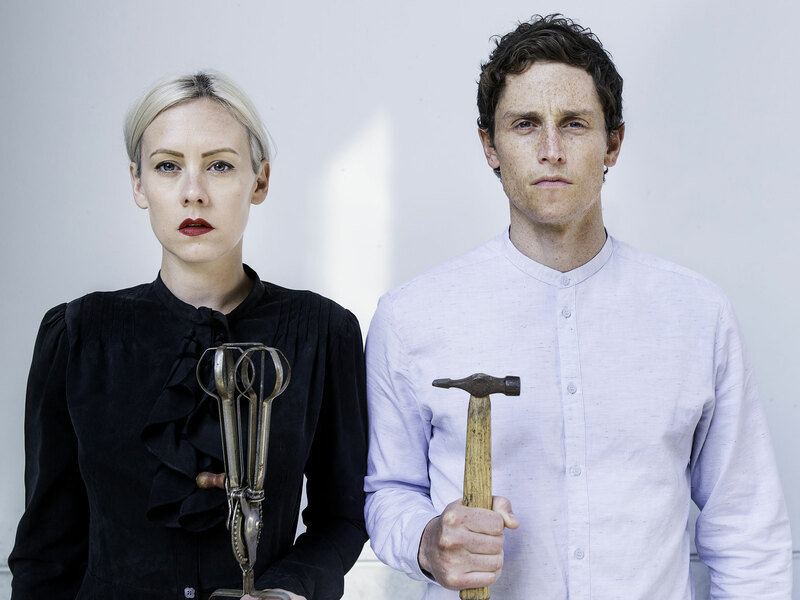 Fake It is in much the same vein and Kimmings and her real-life partner Tim Grayburn have built a powerful show about Grayburn’s experience of depression. They weave together recordings of them chatting, weird songs, really good quality props, set and costumes into a complete whole which is much more than the sum of its parts. Summerhall used to be Edinburgh’s small animal hospital. See a show there and you might be sitting in “The Old Lab” or “The Anatomy Lecture Theatre”. Those names, their hints of utility and experiment, are suggestive of the kind of performances found at Summerhall: bare stages, on which small casts try to make as much use as they can out of a few props, inches from the front row. In such circumstances, audience interaction can become a necessity. At one point in the performance I saw, Sven Ronsijn, embodying Gomaar, recruited an audience member as an impromptu translator to help him describe the state of Gomaar’s drunk step-father. I wasn’t being highfalutin when I wrote that Ronsijn embodies Gomaar: the cast switch between addressing the audience (in character) and acting out scenes with puppets. Gomaar is mostly, but not always, played by Ronsjin. The puppets have only vaguely defined features but, paradoxically, this makes it easy to imagine ripples of thought and an inner life passing across their faces. The performers half hold, half wear the puppets – their arms become the puppets’ arms. Sometimes the actors seem like drunken burdens to the puppets; sometimes it’s more like they’re taking part in a giddy dance with them. But that always fits the characters’ moods, and the actors do a lot with an arm and a voice. There’s a moment when Gomaar surprises his mother by visiting her from the city along with his new girlfriend. The way Els Trio moves and talks as the mother captures her joy, but also the flickers of loss and fear a parent might feel when faced with the sudden appearance of their grown-up offspring. The Roundabout is a portable theatre created by Paines Plough which debuted at last year’s Edinburgh Fringe and has toured the country since. All the parts of it will fit into one truck and it can be put together using only an Allen key. Once you’re in, it’s a really lovely in-the-round space, lit by LED lights from above and with excellent acoustics. It made a fantastic setting for Chicken. Chicken is set in East Anglia at a time when the East is about to “separate” from the rest of the UK, and is planning to base its economy on the twin industries of bicycles and chicken farms. Chicken is at the Roundabout @Summerhall until August 30 (not 25). ‘Cinema’ is about death – he’s even addressed as if he was in the audience. The play tells the true story of a fire at the Cinema Rex, in Abadan in Iran, in 1978. The fire was started deliberately, possibly in an attempt to stir up feelings against the Shah – the protests that occurred in the aftermath eventually became the Iranian revolution. We’re told the story by Sharzad, a stray cat who lived in the cinema. Nazli Tabatabai is great as our feline narrator, doing subtle things with the way she walks and moves her hands, and conveying a catlike lack of concern for what you think of her, how she’s lived her life or what she eats. She addresses the audience as if we were sitting in the Cinema Rex, forcing us to think about the horrible way that more than 400 people had to die. The script, by Steven Gaythorpe, examines the economic and political contexts of Iran in the 70s. It looks back to One Thousand and One Nights (Sharzad is named after the storyteller who saved her own life by telling the King of Persia stories so engrossing that he forgot to murder her on their wedding night). And it tries to say something about the power of stories, whether told around a fire or in a cinema. And it’s also the biography of a cat. If that sounds like a lot, it is: maybe too much for a single hour running-time. Like Fake It ‘til You Make It, The Hitchhiker’s Guide to the Family is a “created” show. Its writer and performer, Ben Norris, decided that he really didn’t seem to know his dad very well, so set off to hitchhike through all the places his dad had lived and so in the process try to find him. Deciding to do something, and then making a show about it, is a tried and tested way to create a show, although there can sometimes be a nagging question: why decide to do it at all? I’m not sure that Norris’ own relationship with his father was quite interesting enough to me, but he did take in wider themes like the role of football in society and families in general and I enjoyed it without being really moved. The Hitchhiker’s Guide to the Family is at Underbelly Cowgate until August 30. In We This Way, Seth Kriebel sits at desk, lit by a lamp and tells you a story. But this story is in the second person and at a certain point you’re given a choice about what you want to do (you’re on an underground train, you can get off or stay on). You’ll have been given two coloured glow-sticks when you took your seat and you can raise one to indicate your preferred choice. Kriebel tallies the votes and… off you go. It’s a story for the kind of people that like stories that start on trains, and if your heart glows at the thought of lighthouses, abandoned fun-fairs and sunken treasure, you’ll probably enjoy this show. You might also meet a minotaur wearing reading glasses or find a flight of stairs inside a suitcase. That ‘might’ is crucial because Kriebel tells you it’s only possible to hear half the story in a single performance. I will admit to feeling some frustration when pondering what I missed out on – particularly when the dumb-dumbs in the seats around me voted for the wrong choice. No doubt Kriebel would tell you that is part of the show. In fact, you will find that sometimes you don’t have a choice, or a handful of you are choosing for the whole audience. When you leave, you get a badge and you’re encouraged to look for other folk wearing the badge and ask them what happened in their story. As well as being a canny way to publicise the show, I assume this means Kriebel is mostly safe from punters unhappy about how their story turned out expressing themselves forcefully. Or maybe he’s not. Stories can end all sorts of ways, especially when you involve an audience at the Fringe. We This Way is at Summerhall until August 30 (not 25). Blake and Lissy are taking a well-earned rest.